RealTime Gaming has a fabulous new game that is sure to appeal to most online gamblers. Known as Cash Bandits 2 slot, this game has excellent gameplay and it also gives out attractive wins in addition to a progressive jackpot. The game follows the highly popular Cash Bandits game released a while ago by the same developer, and there is a good chance that it will be just as popular as its predecessor. The Cash Bandits 2 slot game is available on a whole lot of RTG powered casinos catering to customers located in different parts of the world. There are plenty of these casinos given that the company is one of the top rated gaming software developers in the industry. Some of the best sites to catch this game include SlotsPlus Casino, Slotastic Online Casino, and Intertops Casino although there are much more. Many online casinos offer bonuses and promotions designed to get players to try out this game, and these bonuses give players a great opportunity to win some cash without wagering any money of their own. It is also possible to play this game for free on trial mode just for the fun of it. 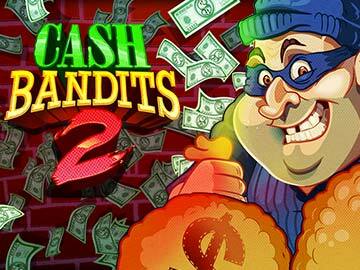 Cash Bandits 2 slot has a fabulous animation that features the police and the bad guys of the title. The symbols used in the game include handcuffs, burglar alarms, banks, and loot bags. The sound effects of the game also add to the overall fun of it. The slot game has five reels and twenty-five pay lines spread over three rows. The pay lines are variable, giving players the opportunity to wager on as many as they want. Players can also wager differing amounts of money to suit their budget. Players can try their luck at the two jackpots offered by the game. One is the regular jackpot. It gives a 5000x payout when five of the wild symbols land on an active pay line. The other is a progressive jackpot that can become really big because all the players trying out this game contribute a sum of money to the pot whenever they place a wager here. The progressive jackpot is triggered randomly. There are multiple bonus features in this game and they offer players plenty of options to get attractive wins. For one, there is the vault bonus game which is launched via the scatter symbols. This is a pick’em game. The players can win a maximum of 190 free spins in addition to a 17x win multiplier. The game also has Wilds that can take the place of other symbols in order to complete winning combinations. Also, as mentioned above, the wild helps trigger the minor bonus of the game. 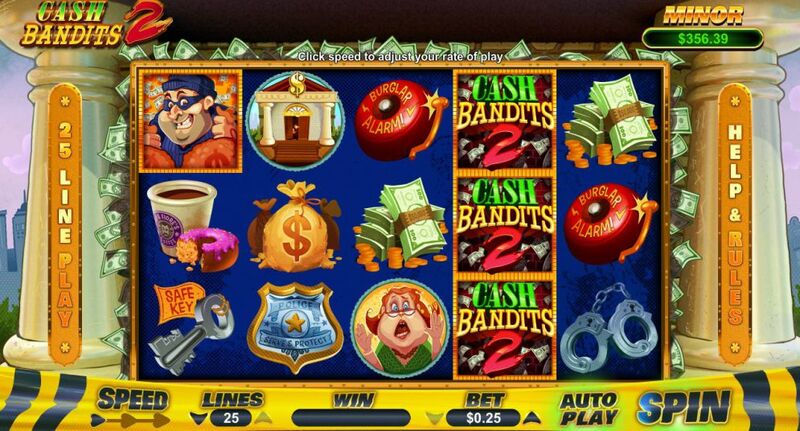 The developers have ensured that Cash Bandits 2 slot can be played on a wide range of devices to suit the needs of customers. These include PCs and mobile devices (Android and iOS) such as smartphones and tablets. As a matter of fact, the game plays very well on smaller devices. It can be enjoyed even when players are on the move. Overall, Cash Bandits 2 slot is a thrilling game that is definitely worth playing just for a chance to win the big jackpots. Also, we don’t want miss out on the wins from the bonus features. With a Return to Player percentage (RTP) of 95.3%, this game ensures that players will keep coming back for more. The game appeals to players having different budgets. It has to be pointed out that the game’s volatility tends to increase when bet values are high. Even so, high rollers will surely want to give it a go.